Iconic riot grrrl pioneers Bikini Kill disbanded back in 1997, but the group are reuniting for a series of concerts later this year. The band will perform in Los Angeles on April 25, Brooklyn on May 31 and New York on June 1. Bikini Kill members Kathleen Hanna, Tobi Vail and Kathi Wilcox will be joined by guitarist Erica Dawn Lyle for the shows, replacing guitarist Billy Karren. 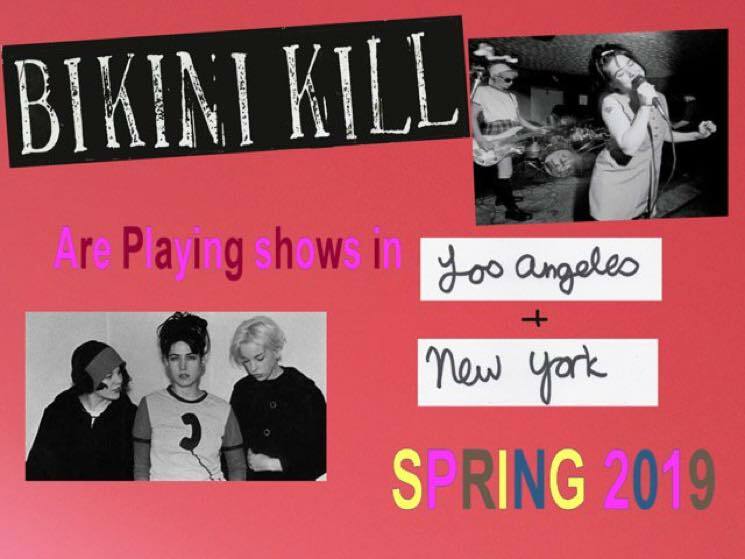 The string of live dates will mark Bikini Kill's first full performances since the band broke up, though three of the four original members (Hanna, Vail and Wilcox) did play one song together in 2017 at the launch of the 33 1/3 book about the Raincoats. Bikini Kill have made no further announcements about additional upcoming live performances or new music. So if you want to be sure to catch the reunion, make plans to travel to one of the dates listed below. Tickets go on sale this Friday (January 18).